These findings, published in the Journal of Neuroscience, suggest that in order to forget an unwanted experience, more attention should be focused on it. This surprising result extends prior research on intentional forgetting, which focused on reducing attention to the unwanted information through redirecting attention away from unwanted experiences or suppressing the memory's retrieval. "We may want to discard memories that trigger maladaptive responses, such as traumatic memories, so that we can respond to new experiences in more adaptive ways," said Jarrod Lewis-Peacock, the study's senior author and an assistant professor of psychology at UT Austin. "Decades of research has shown that we have the ability to voluntarily forget something, but how our brains do that is still being questioned. Once we can figure out how memories are weakened and devise ways to control this, we can design treatment to help people rid themselves of unwanted memories." Memories are not static. They are dynamic constructions of the brain that regularly get updated, modified and reorganized through experience. The brain is constantly remembering and forgetting information—and much of this happens automatically during sleep. 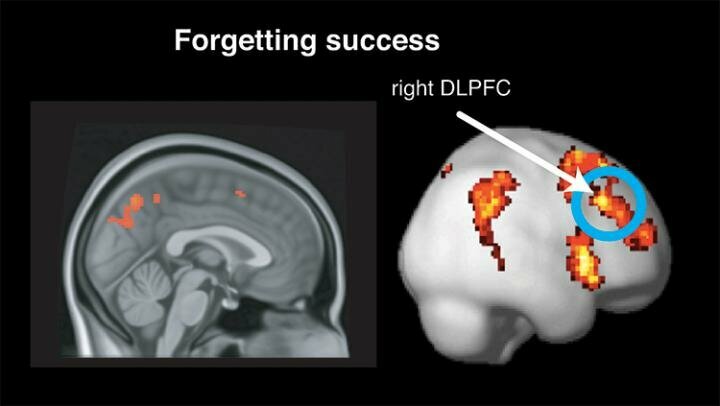 When it comes to intentional forgetting, prior studies focused on locating "hotspots" of activity in the brain's control structures, such as the prefrontal cortex, and long-term memory structures, such as the hippocampus. The latest study focuses, instead, on the sensory and perceptual areas of the brain, specifically the ventral temporal cortex, and the patterns of activity there that correspond to memory representations of complex visual stimuli. Their findings not only confirmed that humans have the ability to control what they forget, but that successful intentional forgetting required "moderate levels" of brain activity in these sensory and perceptual areas—more activity than what was required to remember. "This will make way for future studies on how we process, and hopefully get rid of, those really strong, sticky emotional memories, which can have a powerful impact on our health and well-being," Lewis-Peacock said.